Sturdy yet comfortable school chairs ensure that your students pay attention longer instead of fiddling in their seats. 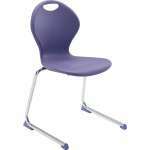 Both teachers and students need school chairs that provide support throughout the long school days. How should you choose chairs for your classroom? Look for a design that combines aesthetics and ergonomics. We have a wide selection of hard plastic, polypropylene or classic wood chairs. Our Inspiration and Educational Edge series add color and style to any classroom; combo desks save space as well as money. Whatever your needs, we have student chairs that fit the bill – and the budget. Gone are the monochromatic, uniform, wood and metal school chairs of the past. 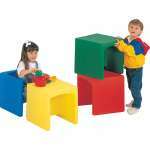 Today&apos;s school chairs are exciting, colorful and come in a wide variety of styles and materials. While this is a big boon for students and teachers, purchasing school furniture was much easier before things got so sophisticated. Now administrators need to be familiar with concepts like ergonomic, steel gauge, contact welding, polypropylene and more. Ergonomic is a term that gets thrown around a lot these days. It seems as though every other school or office chair on the market boasts "ergonomic features" or "ergonomic design". Essentially, ergonomic furniture is any furniture item – in this case, school chairs – that&apos;s designed to provide support to those parts of the body that take the most stress. In the case of chairs, that would primarily be the knees and back. When a school chair is described as having "ergonomic features", that&apos;s an indication that while the entire chair is not ergonomically designed, parts of it offer more support than a standard chair. Elements like waterfall seats and contoured backs fall into this category. While the entire chair doesn&apos;t adjust, these features can go a long way to relieving knee and back stress. Generally speaking, classroom chairs are almost never fully ergonomic; for that, you&apos;ll have to look at task chairs, office chairs and executive chairs. 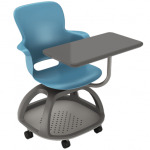 What gauge steel is best for classroom chairs? Anyone shopping for school furniture has definitely come across various gauges of steel. The strength of steel is determined by its gauge. Although it sounds counter-intuitive, the fact is that the lower the gauge, the stronger the steel. That&apos;s because the higher the gauge, the thinner the steel. So the question is, which gauge steel should you be looking for on your school chairs? The bottom line is that it depends on two things: your budget and your student body. Obviously, the stronger the chair, the more it&apos;s going to cost you. If the energy level of your student body is standard, than 18-gauge steel frames will probably work for you, and you don&apos;t have to worry about your budget as much. If, however, you are seriously concerned about the wear and tear on your chairs, then you are going to want to invest in stronger chairs. It might cost you more in the short run, but you will save on repairs and replacements in the long run. Another aspect of steel that makes a difference is the welding. Steel student chair frames are connected to each other by welds. Full-contact welds are much stronger than partial contact, and they last a whole lot longer. Another advantage: there&apos;s a much lower chance of clothing (and fingers) getting caught. What is a polypropylene chair? Polypropylene is another term that anyone shopping for high school furniture has come across. It might sound imposing and technical, but polypropylene is just a soft plastic. The seats on school chairs are made of either hard or soft plastic. Hard plastic chairs are, as their name indicates, hard. They have no give or bend, but are incredibly strong. They can resist just about anything students throw at them, are virtually impervious to pen jabs and clean like a charm. Soft plastic is, as its name indicates soft – or at least, softer. It has give and bend, and is more comfortable than hard plastic. Students can lean back in their soft plastic chairs, giving them a much-needed stretch in the middle of a lecture. Soft plastic does resist stains and scratches, albeit not to the same degree as hard plastic. 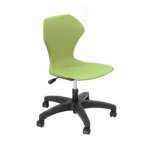 The Academia brand has series of school chairs in both hard and soft plastic, including the popular Inspiration series. You should choose chairs for your classroom based on your needs and budget. Determining which school chairs suit your classrooms best can be a time-consuming effort. For expert advice, feel free to contact Hertz Furniture&apos;s Design Center, where you&apos;ll find a number of school furniture specialists who will be happy to assist you. How can you get financing? We offer a number of financing solutions to help ensure that you get the school chairs you need at a price you can afford.